This book was written with several objectives in mind: 1. To share with as many scientists and engineers as possible the intriguing scientific aspects of ultra-fine particles (UFPs) and to show their potential as new materials. 2. Entice such researchers to participate in the development of this emerging field. 3. To publicize the achievements of the Ultra-Fine Particle Project, which was carried out under the auspices of the Exploratory Research for Advanced Technology program (ERATO). In addition to the members of the Ultra-Fine Particle Project, contributions from other pioneers in this field are included. To achieve the first objective described above, the uniformity of the contents and focus on a single central theme have been sacrificed somewhat to provide a broad coverage. 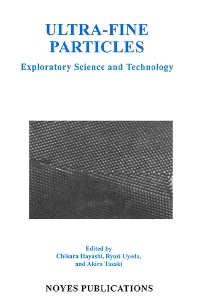 It is expected that the reader can discover an appropriate topic for further development of new materials and basic technology by reading selected sections of this book. Alternately, one may gain an overview of this new field by reviewing the entire book, which can potentially lead to new directions in the development of UFPs.